Absolutely free mathematical program with "paper"-like interface and numerous computing features (now with integrated mathematical reference book). Insert Unit dialog improved to allow displaying properties as dimensions if defined. SMathStudioDesktop.0_97_5329.Mono.tar.gz (Date: 04.08.2014. File size: 992.22KB) - last version of Mono distributive required! SMath Studio tutorial by Bernard Liengme. Introduction of the use of SMath Studio by Gilberto E. Urroz, Ph.D., P.E. SMath Studio icons ( ) of all available sizes (16x16, 24x24, 32x32, 48x48, 64x64, 96x96, 128x128, 256x256) in PNG format. 1 user thanked mkraska for this useful post. Hi! I have problem after updating to the lastest version from previous one. After opening sm file, which contains combobox region, program crashes. I'm the only one to experience this problem? 1 user thanked w4cek for this useful post. no you are not. the very same calculation sheet with comboboxlist does not, but the old combobox makes it crash. 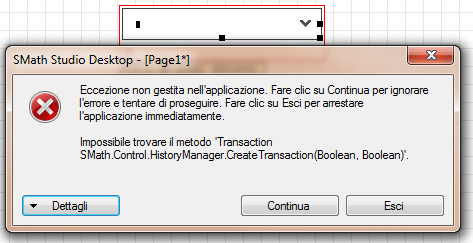 System.MissingMethodException: Méthode introuvable : 'Transaction SMath.Control.HistoryManager.CreateTransaction(Boolean, Boolean)'. I've updated my sources with new APIs but I've not noticed errors compiling the plugin. Seems your really need just to rebuild (recompile) your plug-in (with version number changing). The thing is that improvements done for Areas support made it possible to remove second optional argument of CreateTransaction function and looking at the error you show this might be a reason. To say truth I didn't know that this change can result in any problems. Thank you Andrey you're right (obviously), the recompiled plugin works fine. EDIT I've made a massive update of control regions. RadioButtons pluging must follow the same treatement. The syndrome of recalculating the page after each line introduction is no more active with the new version, but it is transfered now on the event click on ComboBoxList or RadioButton. I don't understand, what do you think is wrong? P.S. as for now seems that I can't no more trigger evaluations with using(CreateTransaction()) therefore some preview functions of various regions may need to close the settings form to see them. I did not experience any problem with control regions. Thus I did not do the plugin update so far and wonder if I should do. I also like Martin I had no problems right now and I don't know if it is useful to update the plugins. 1 user thanked PompelmoTell for this useful post. Simply, by clicking a comboboxlist, the program crashes. I confirmed this on two different computers (Windows 8.1). Portable distribution updated. Now with current SMath version and updated interactive handbook. First of all, thanks Andrey for developing this great app and thanks everyone who added more functions to it with further developments! I have upgraded to the newest version recently and had been experiencing problem with a file that was fine before. It happened when I scrolled to the right of the file where there are some images pasted in the region. The program would crash, the Window with the error message would pop up and the scroll region would show only red "X". I could click continue and pull down the new split region to keep working on the file, but if I scrolled right again, same thing would happen to that region and then I had to close the file, because both regions are now just filled with a red "X". Sometimes it would work when I scroll right, but then it would crash when I scrolled down. I am wondering if anyone has experienced that, I have updated all plug-ins, thanks. I have upgraded to the newest version recently and had been experiencing problem with a file that was fine before. It happened when I scrolled to the right of the file where there are some images pasted in the region. This is a known bug. Andrey marked it as fixed (thus you normally won't see it in the bug tracking system) but there is no corresponding maintenance release so far. Thanks for your reply Martin! I will await patiently for next update, for now, I have rolled back to carry on.